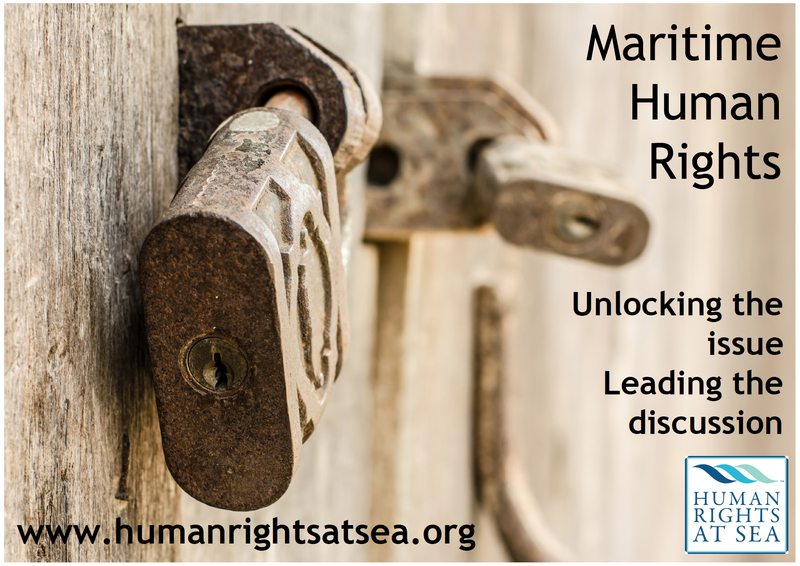 Human Rights at Sea launches long-term “Unlocking the issue” campaign. LONDON. 20 April 2015. [Updated 24 May 2016]. Senior Shipping Executive. March 2014. The aim of the “Unlocking the issue” advocacy campaign is to bring human rights awareness to the forefront of the maritime and fishing industries and their regulators. The Human Rights at Sea advocacy campaign will be structured around numerous initiatives that aim to develop maritime human rights by providing objective case studies, academic interpretations and model documentation for international consideration and voluntary use. “12 months ago, the now recognisable term of “Human Rights at Sea” did not exist; neither did an international advocacy platform highlighting this fundamental issue specifically in the maritime environment. Today, as a platform Human Rights at Sea leads public discussion on the topic which is expanded through its numerous international projects aimed at supporting the human element, without which global maritime transport of goods and provision of services, as well as the fishing of essential food resources, could not occur. Human Rights at Sea is therefore pleased to announce the commencement of its long-term international advocacy campaign aimed at “Unlocking the issue” of open and explicit discussion concerning the application, enforcement and development of measures addressing human rights issues among the maritime and fishing industries, their respective supply chains and their global supporting communities. This includes among other related initiatives, kick-starting the discussion on the need for driving up international maritime standards for effectively combating abuses at sea; be it the enslavement of fishermen in blue water fleets, the suspicious disappearance and murder of seafarers, safeguards for foreign crewed vessels, accountability of flag States for abuses on their ships, wider development of maritime Corporate Social Responsibility (CSR) policies on behalf of the human element, and the prosecution of abusers in national courts. Since its inception in April 2014 Human Rights at Sea has publicly stated that in this current day and age, the application and understanding of human rights in the maritime environment by application of “Fundamental Rights” is insufficient. For example, most seafarers and fishermen have not heard of, nor understand the State implications of the Universal Declaration of Human Rights 1948, the extent to which the State and flag States are responsible for protecting rights, or the UN Guiding Principles on Business and Human Rights. A recent Crewtoo survey published on 12 March 2015 asked the question: “Do people care about Seafarers Human Rights?” 65% responded No. 35% responded Yes. This says much about how seafarers view the support shown by employers and representative bodies alike. More worrying is the trend by some shipping bodies and individuals in perpetuating a common myth that the Maritime Labour Convention 2006 is a Human Rights Convention which provides all the protections required for seafarers’ human rights. This provides a false sense of security to seafarers covered by the Convention and highlights, at best, a misinterpretation by professional bodies and individuals in positions of influence. As a matter of leadership, Human Rights at Sea calls for open and explicit discussion for the inclusion and application of human rights driven forward as a constituent part of the IMO’s Strategic Plan and associated High Level Action Plans, as well as by individual flag States and shipowners in both the maritime and fishing industries. There is no reason not to and a new strategic approach to corporate inclusion of maritime human rights in daily business which does not inherently consider the subject to be a toxic ‘Pandora’s box’ needs to be adopted by the international maritime community. The Human Rights at Sea charity has been independently developed for the benefit of the international community for matters and issues concerning human rights in the maritime environment. Its aim is to explicitly raise awareness, implementation and accountability of human rights provisions throughout the maritime environment, especially where they are currently absent, ignored or being abused.